This is one of those wedding that you’ll wish you were at. Not only to celebrate at a unique venue, nestled in the trees of British Columbia, but to witness the love between two very special people. 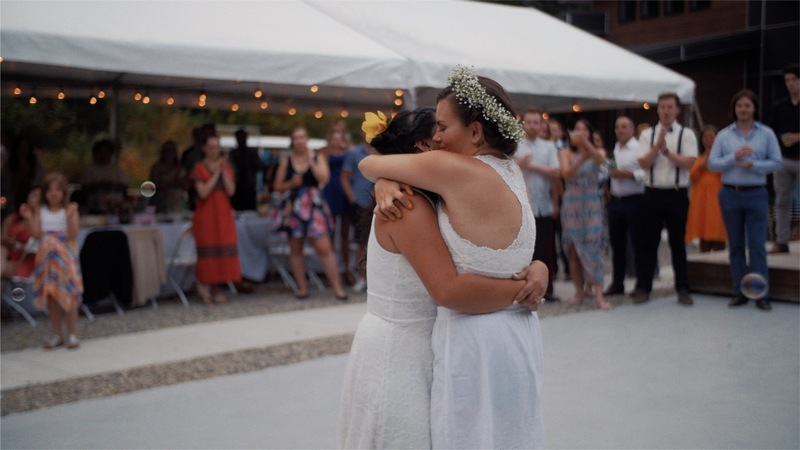 From the moment we met April and Chloe, it became clear that we had to film their wedding. They had a unique story to tell and we felt so lucky to document a part of it. Most couples that we film write their own vows and it is always so worth it. To say something personal to each other on the day make the experience that more special. What we absolutely love about April and Chloe’s vows is how they paint a picture of their life together. Their words really drew us when we heard them. Not just because they sounded nice, but because our minds were filled with images of their life. We also love how dynamic they are. They both express themselves slightly differently but each phrase means something. It might be heartfelt, emotional, hopeful or humorous. Either way, they clearly spent the time to really think about what to say to each other. And that is why the film begins with, and is based around the vows, because they’re deep, thoughtful and unique. We set aside a little extra time with April and Chloe, filming some intimate footage around Whytecliffe Park and Second Beach in Vancouver. It was a great way to get to know them even better and add some romantic shots to the film. The wedding day itself happened right in the middle of the BC Wildfire season and was covered in smoke which diffused the light nicely. But we were really happy to have the extra footage with the nice golden light. It ended up being another way to emphasis the dynamic of the film. Having that extra footage also gave us some great little candid moments which helped to illustrate the words April and Chloe said to each other. We loved the playful action on the beach, splashing in the waves as the sun set. We also like how we were able to expand the “world” of the film by adding in extra locations around BC. April and Chloe were so enthusiastic about their wedding video. They did everything we asked of them and were so easy to film. We sometimes have to give couples a little direction but with these guys it was more of a case of “go over there and be yourselves”. All those great shots really are genuine moments that were captured. We’ve used the word “dynamic” a few times in this blog post, but that really was the tone of this wedding. April and Chloe took us on a ride through a day filled with emotional moments and good times. We love how the energy of this film continues to build all way to the end. And it feels like it could keep going too. The smokey sky combined with April’s touching words seemed to be the perfect way to begin their story. But we also had Chloe’s humour some crazy dance moves to boot. There’s a very touching first look, goofy activities and friends helping out all day long. Copyright © 2019 Kismet Creative Wedding Films // Wedding Videography Toronto & Vancouver. All rights reserved.